Protect your home with the TIGERSECU Analog D1 16-Channel Home Security DVR Digital Video Recorder. This Certified Refurbished home security digital video recorder is tested and certified to look and work like new. The refurbishing process includes functionality testing, basic cleaning, inspection, and repackaging. The product ships with relevant accessories, a minimum 90-day warranty, and may arrive in a generic box. This 16-channel D1 surveillance DVR digital video recorder supports D1 720x480 resolution security cameras (sold separately). Remotely access, play surveillance footage, and control your CCTV security system with TIGERSECU's stable and speedy eCloud service, viewing video online with no service fees. T-Mobile Unlimited Data users may access remote reviewing on mobile devices by connecting to a wireless network. Set up this home security DVR recorder easily in a matter of minutes and record real-time audio/video surveillance footage. Simply connect security cameras (sold separately) to a power supply and experience peace of mind by monitoring your property. This set includes one 16-channel home security DVR recorder, one power supply and quick start guide. Security cameras and hard-drive are sold separately. For over 20 years, TIGERSECU has been dedicated to making high-definition security cameras and CCTV systems to protect your family and keep your home secure. With DIY customers in mind, TIGERSECU's goal is to make security systems installation easy and affordable. Advanced features from professional quality CCTV are streamlined to make setup easy, with just a few steps. Customized apps support mobile viewing and remote notification to keep you informed while you're away from home. 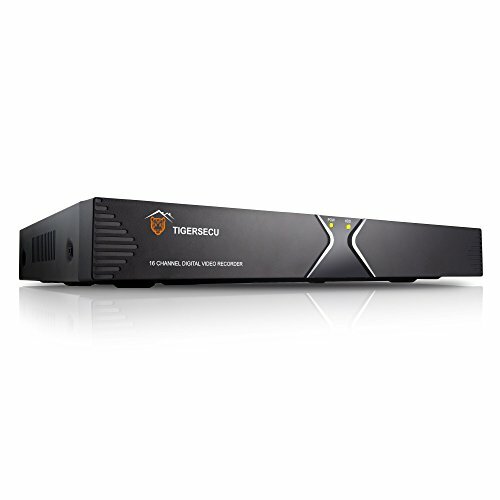 TIGERSECU certified refurbished products are backed by a 90-day manufacturer warranty. This D1 home security digital video recorder is only compatible with D1 720x480 security cameras (sold separately). This is NOT compatible with AHD, TVI, CVI and other high resolution security cameras. Remotely access, play surveillance footage, and control your CCTV security system with TIGERSECU's stable and speedy eCloud service, viewing video online with no service fees. T-Mobile Unlimited Data users may access remote reviewing on mobile devices by connecting to a wireless network. Set up this home security DVR recorder easily in a matter of minutes and record real-time audio/video surveillance footage. Simply connect security cameras (sold separately) to a power supply and experience peace of mind by monitoring your property. This set includes one 16-channel home security DVR recorder, one power supply and quick start guide. Security cameras and hard-drive are sold separately. If you have any questions about this product by TIGERSECU, contact us by completing and submitting the form below. If you are looking for a specif part number, please include it with your message.